Brian Colgan and crew deliver great classic rock! 6¢ (Six Cents) is in their 12th year together as a versatile and multi-faceted classic rock band. 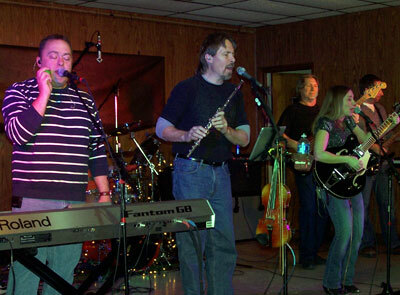 Original founding members Brian Colgan; (vocals, guitars, keyboards, flute and violin) and John Keefauver; (keyboards, sax, guitar and vocals) are joined by Aaron Baugher, (guitar and keyboards), Jim Hinckley (vocals and drums), Jeff Maus (bass and vocals) and Carly Herb (vocals and guitar). Their broad range of music covers lighter acts like America, James Taylor and Alison Kraus to the eclectic music of the Dave Matthews Band, Steely Dan and Rusted Root, to the full out rock of Boston, the Eagles, Led Zeppelin, Heart and Pat Benetar. The band released a self produced CD of their own material, entitled "Heads Up" in 2008 and plans more original recording in the future. Tons of vocal harmony, instrumental versatility and an ability to cover a wide spectrum of styles and eras adds up to the popular Hanover area based band, 6¢.